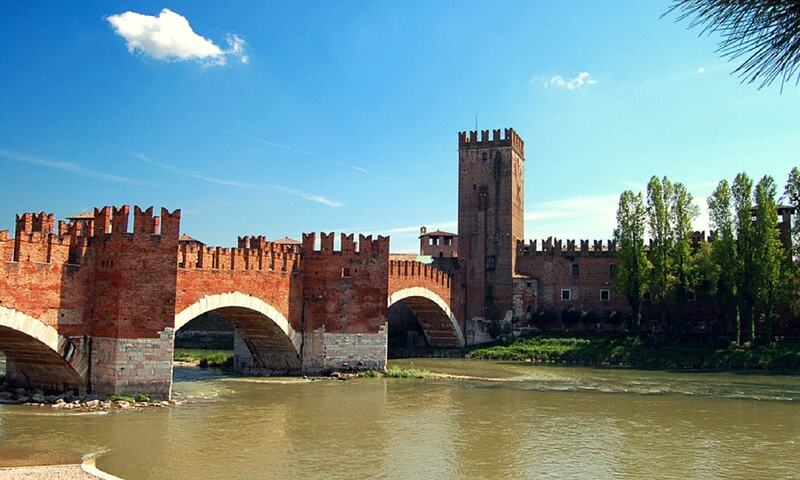 Castelvecchio is the most important military construction of the Scaliger dynasty that ruled the city of Verona in the Middle Ages. The castle is powerful and compact in its size with very little decoration - one square compound built in red bricks, one of the most prominent examples of Gothic architecture of the age, with imposing M-shaped merlons running along the castle and bridge walls. It has seven towers, a superelevated keep with four main buildings inside. The castle is surrounded by a ditch, now dry, which was once filled with waters from the nearby Adige. Castelvecchio is now home to the Castelvecchio Museum and the local officer's club which can be accessed through the left door on Corso Cavour.